MicroSociety language learners outscore their peers in comparison studies. Growth in the number of students from minority backgrounds is putting enormous pressure on our schools to improve achievement while accelerating cultural cohesion. In this context, nothing speeds language learning like necessity and immersion in the activities of daily life. 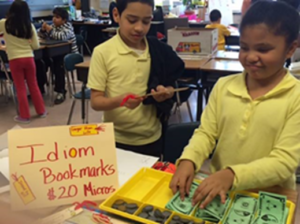 Nearly 17 years ago, Sageland Elementary School in El Paso, Texas, embraced MicroSociety as an extended day strategy and test scores soared over 200%. Within a few years, it moved from being one of the lowest performing schools in Ysleta District to being recognized as a National Blue Ribbon School and with the new STAR test, earned the highest rating in Texas. 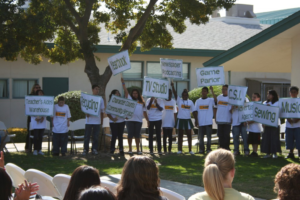 In California, Chula Vista Learning Community Charter School, with its 5-star rating on greatschools.org, achieved a 63% increase in test scores over ten years as compared to other district schools and was awarded the Title I Academic Achievement Award and the California Business for Educational Excellence Award. In New York State, MicroSociety is approved for Title III because of our documented track record of success with children of families newly arrived to this country. Our Limited English Proficient (LEP) students outscore LEP students in comparison schools in the district as well as students in statewide comparison groups. 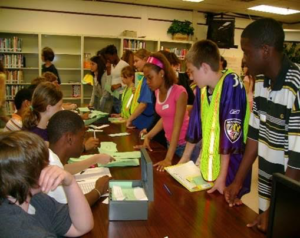 100% of MicroSociety students learn and apply the responsibilities of citizenship. MicroSociety is a tool for political enfranchisement. The process begins with a Constitutional Convention and signing a Citizenship Contract. This body of law governd the society’s operations and guides citizens’ behavior. Unlike traditional student governments, which debate a narrow range of issues and schedule social events, the MicroSociety government is empowered to propose, enact and evaluate policy measures, design programs and approve annual budgets to fund them, and levy and collect taxes. Laws start simple but grow in complexity. Should a citizen who breaks the law be allowed to vote? When should an elected official be impeached? When should the constitution be amended? What is the value of separation of powers? The process of framing a constitution provides citizens with a laboratory in which to examine these issues from year to year and an opportunity to reflect on the underlying principles of community-building. Matters of citizenship drive debate in Town Hall discussions all year and serve to advance the society. By changing the context, we change the content of learning about citizenship to living it. MicroSociety students want to be in school because they see that it prepares them for the real world. At a time when boredom and failing to see a concrete connection between the classroom and their future work are top reasons students drop out of school, attitude becomes a critical motivator for success. We know that the decision to drop out doesn’t happen overnight. 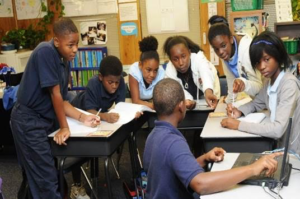 Research shows the process too often begins in elementary and middle school with students who are disengaged. At MicroSociety, we find the most effective way to motivate youth to stay in school is by ensuring they have early access to a wide range of opportunities to feel engaged and experience success. As one Texas alum stated, “Why would I drop out when I know that I have future?” Through venture and agency jobs, MicroSociety multiplies the amount of structure, responsibility and opportunity students have to discover which activity engages their minds and they scaffold those opportunities naturally. 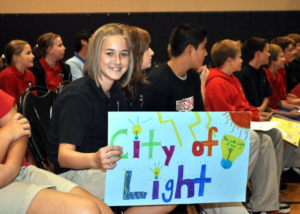 MicroSociety provides an early start to cultivating a high-energy, positive culture, one that sustains effort and builds students’ capacity to process creatively the connections between school life and real life. 100% of MicroSociety youth develop entrepreneurial skills and micro-enterprise assets, proven strategies for counteracting the sense of helplessness in communities struggling to access the economic mainstream. Our structured experiential learning activities use math, civics, social studies, science and their real world applications to guide young people in self-discovery and to counter their perception of having limited options. A partnership in King County, Washington, created a winning MicroSociety after-school program focused on helping underprivileged youth overcome poverty by gaining the personal assets needed to become creators of wealth. Two years into the project, the national Boys and Girls Club of America awarded Renton-Skyway first place in the nation among its 4,000 Clubs, citing the success of its MicroSociety program. Attendance and donor base grew and revenue tripled. 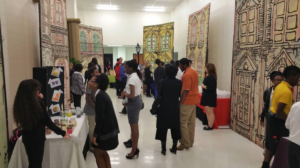 Youth demonstrated improved self-confidence, goal-setting, leadership and academic skills and a greater interest in graduating from high school and college. 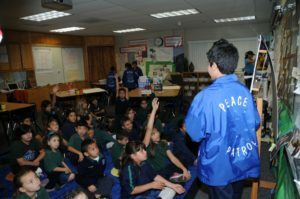 MicroSociety students experience the benefits of a positive peer culture. Traditional school reform strategies focus on changing teachers, training administrators and increasing expenditures. The MicroSociety intervention occurs on a different dimension – the student peer culture. We find that what may appear to be a behavior problem is actually an engagement problem. For example, court room officials in Florida become expert at reading between the lines to uncover motives. Skills honed on the job translate to deeper reading comprehension and reading with understanding at a higher level in a more sophisticated text. Or in Fresno, California, one of the country’s most dangerous middle schools turned around in just two years. Consider Jeremiah, a frequent flyer to the principal’s office, who wanted to work at the Health and Wellness. 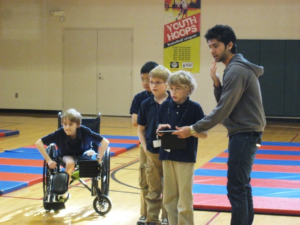 When 6th grader, Kylie, explained that he could not “put down the customers”, he quickly agreed if he could only become the “hoops coach.” His first client, Jake, wheeled into the gym. But Jeremiah bit his lip and by the end of the lesson, Jeremiah had forgotten about the wheelchair and his customer told Kylie, “It was worth my Micros. My coach was so nice.” Titles that bring a sense of significance and pride: mayor, judge, CEO, energy auditor, marketing director, and hoop coach quickly replace loser, bully, lazy, jock and impaired. By turning over discipline and accountability to students, it becomes possible to convert these challenges into opportunities for growth. MicroSociety creates critical thinkers and problem solvers, two of the most powerful and undisputed solutions to preparing our youth for what lies ahead in high school and beyond. The MicroSociety learning environment debunks the “multiple choice” approach and instead fosters critical thinking and critical decision making skills and prepares children for real-life applications. Students are leaders, professionals and innovators now, not simply groomed for these roles in a distant “later”. They are not just asked to solve problems but invited to create them on-the-job while developing the patience and grit to be comfortable with challenge and change. For the New Britain School District in Connecticut, the 21st century MicroSociety School answered the call for a more rigorous and relevant learning community. HALS Academy embraced MicroSociety as a tool for providing students with a challenging, rigorous and relevant educational program that would prepare them for future success. Two years into MicroSociety implementation, HALS ranked the top-performing school in the state. 100% of MicroSociety students learn how to manage personal and professional finances. The ability to use knowledge and skills in order to manage financial resources effectively is about more than being able to balance a checkbook. Increasingly it is about being able to manage personal and professional finances effectively and ethically and the ability to understand concepts in order to make wise financial decisions. These are seen as essential for participating members of a global community. In Oklahoma, for example, the state Legislature has made financial literacy a priority. High school students are now required to satisfy the State’s Passport to Financial Literacy. Meeting them poses no challenge for the students of Thoreau Demonstration Academy in Tulsa where MicroSociety students are meeting nearly all of the state’s high school standards by the end of eighth grade. In MicroSociety, numbers need to make sense for a reason. Consider 3rd grade fashion designer, Alisha in Albuquerque. She works with percentages when she puts out-of-season inventory on sale for 25% off and select items on clearance for 50% but she goes back to the classroom wanting to know more about how to calculate “trickier” percentages like 15% and 60% of a number. How is 50% and “half off” the same thing? a question which lead her teacher into a discussion of percentages, but also fractions and decimals. 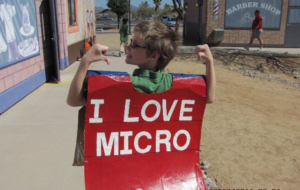 MicroSociety is an-every-type-of-child community. It is not about the success of one, but the sum of the group dynamics. We believe that it is precisely the different gifts each brings to the table that makes society; school should be no different. MicroSociety makes the abstract real and humanizes the institution of education by connecting each child’s gift and interests with a need in the society. 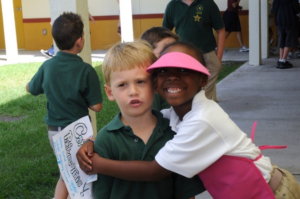 Just ask Emma, the newly elected 9 year old Vice Mayor of a MicroSociety after school program in Sarasota, Florida. With Asperger’s Syndrome, she remarked “Do you have any idea how humiliating it is for someone my size to be bullied by a kindergartner?” That was before MicroSociety. As Vice Mayor, she enjoys the respect of others and exclaims “Finally, my chance to do something big! I’ve gained confidence and know I can be a leader.” Or Colby, he is autistic. Before being transferred to his Philadelphia MicroSociety, he had not spoken a word in school – to anyone – for two years. But when Maya let Colby know at his interview that if he wanted to get paid, he would have to share his research, out loud, so others could learn from it, he did – after a few docked paychecks. Adam, a 4th grader with autism, could not be charged with any responsibilities – that is until he opened his own taxi service. Holding their hands tightly, helping them enter his red wagon and using a trusty map as a guide, he “taxies” kindergartners around the Micro Marketplace and returns them to class on time. MicroSociety is a magnet for families. Used as a stand-alone theme for a charter or magnet school, MicroSociety also seamlessly integrates with a wide range of existing themes such as Performing Arts, Global Communications, STEM, STEAM or other models such as Montessori or Career Academy. MicroSociety is a multi-faceted structure under which nearly anything else can fall.